This book is for prescribers specializing in psychiatry, primary care physicians, nurse practitioners, psychologists and pharmacists. 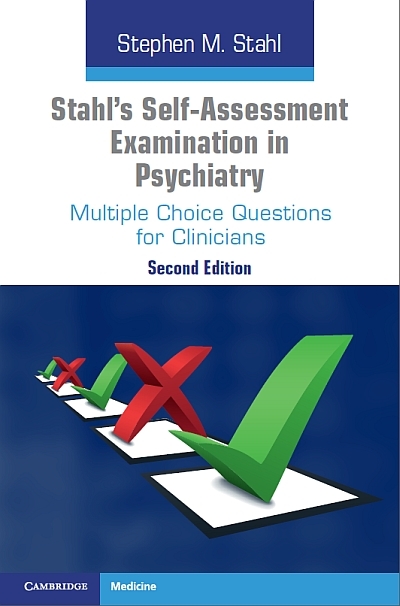 Featuring 150 new and updated case-based questions, divided into ten core areas of psychiatry, this collection will help you identify areas in which you need further study. Each question is followed by an explanation of the answer and a list of references. After completing the questions you will be better able to: • diagnose patients presenting with psychiatric symptoms using accepted diagnostic standards and practices • implement evidence-based psychiatric treatment strategies aligned with the patient's recovery goals • integrate recent advances in diagnostic and treatment strategies into clinical practice according to best practice guidelines. This collection has been approved by the American Board of Psychiatry and Neurology as part of a lifelong learning and self-assessment program and as a component of maintenance of certification. Stephen M. Stahl is Adjunct Professor of Psychiatry at the University of California, San Diego, and Honorary Visiting Senior Fellow in Psychiatry at the University of Cambridge, UK.